Fiction – hardcover; Headline Review; 288 pages; 2011. Review copy courtesy of publisher. 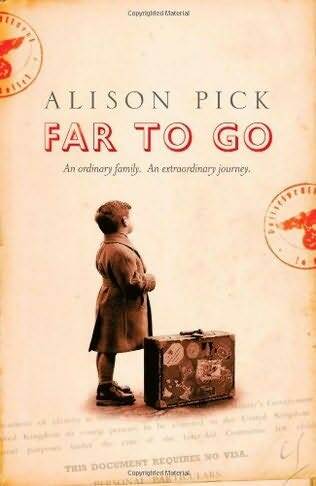 Alison Pick’s Far to Go has been longlisted for this year’s Man Booker Prize. It is billed as a history of the Kindertransport — in which nearly 10,000 Jewish children were sent to Britain to escape Nazi Germany during the Second World War — but that’s really only part of the story. The heart of this novel revolves around a married couple, Pavel and Anneliese Bauer, who fail to agree on how to personally deal with the invasion of Czechoslovakia, their homeland, by the Nazis. The pair are well-to-do non-practising Jews. Pavel, a wealthy and successful industrialist, refuses to believe that he should do anything other than carry out his life as normal. He is fiercely nationalistic and does not accept that Czechoslovakia will be occupied. He will not kowtow to the Germans, nor feel ashamed of his Jewishness. But Anneliese, his rather uptight glamorous wife, is frightened. She knows that the political situation does not bode well and takes defensive steps to ensure the family’s safety — moving to Prague, for instance, in the hope that things will blow over. And when they don’t, she is eager to escape eastern Europe altogether. It is only when Pavel continues to bury his head in the sand that she tries to convince him that he should at least think of his six-year-old son, Pepik, and get him on the Kindertransport. Pepik’s trip to Britain is not so much the focus of the novel, but its climax. His journey does not begin until page 245, which is part four of a story divided into five parts. What’s more, much of the tale is told through the eyes of a Gentile, who resides with the Bauer family. Her name is Marta and she is Pepik’s devoted nanny. She is quite naive — and young — and gets entangled in an illicit romantic dalliance with Ernst, one of Pavel’s business associates, that puts the Bauer family in danger. But Marta is kind-hearted and loyal — if occasionally misguided — and very much devoted to her young charge. She is so well drawn that in many ways she is the life and soul of the novel, and it’s hard not to feel for her situation, caught between a young family she wishes to serve and an older man — a Nazi sympathiser — who offers her excitement, passion and intrigue. This might sound like a fairly straightforward story, but Pick frames it in an usual way, breaking up each section with letters between family members — written after Pepik has gone to Britain — and chapters written by a modern Holocaust expert who has a mysterious connection to the Bauers. This connection isn’t revealed until the very end of the book, which makes for a fine conclusion, and adds an extra layer of meaning to an otherwise predictable plot. Far to Go, which is based on Pick’s own family history, is not a typical Holocaust novel. Yes, it’s sad and yes, it’s filled with tragedy and betrayal. But this isn’t a story about what happened during the War, but what life was like before the Nazis banished — and exterminated — the Jews and the legacy that survivors were confronted with after their families had been destroyed. I wouldn’t describe the book as anything particularly special — and I’m loathe to understand its inclusion on this year’s Man Booker longlist — but it’s an interesting story, well told, and there are worse ways to spend your time than reading this one. I think the Holocaust and World War II have been written to death, like Stu said. If you choose to write about those subjects us demanding readers would like to see a completely new angle, but how many new angles are there really on this horrendous part of history? Thanks Kim. I was interested to see what you made of this one. There are aspects of this I do find intriguing – especially the bit about the Holocaust expert. I’ll probably read it sometime, but maybe not just yet. Its a perfectly good novel and it deserves to be successful, but I just don’t think its Booker material. Admittedly, I wasn’t particularly interested in this book when it was pitched to me months ago — way before the Booker listing. But I accepted it on the basis that it was billed as a kindertransport novel and even though I know about the kindertransport I don’t think Ive read a novel about it before. So… I was expecting a lot more about that subject, not the 30 or so pages that focus on it. I should add that that aspect of the novel — Pepik’s journey — is very well done and incredibly moving, and by far the best bit about the book. But on the whole, I wouldn’t urge you to rush out and read this — its a good book, but nothing special. Hi Isabel, I haven’t read The Glass Room so can’t comment. Maybe someone else who has read both might care to compare them… ? I guess that’s the problem with Holocaust novels — how do you write about something in a fresh and original way when its already been covered countless times before? By the same token, I do think it is important we keep reading these kinds of books… it is too easy to forget that terrible history. A fresh approach would be to go back to any first person accounts or diaries or ledgers and use that material to shape the novel. I work at a medical library. A person requested an article from Royal Navy medical journal. The article was a doctor’s report of what he saw when he first entered one of the concentration camps and what treatments he could start to save as many as he could, even though he didn’t think that anyone would survive. This was the first time that I have ever read something like this. It was creepy. Even though the account was sanitized, I read information that I had never seen in the fiction of this time period nor in any movie. If someone goes back to see the ledgers that were kept by the Germans of all the confiscated goods, it would make a great start for a novel. I didn’t realise this was on the longlist – I have it as part of a prize I won, so I won’t be too disappointed it it’s not the greatest for me.